The turning point of women writers, the provoking of traditional ideas, the suffering of high school students everywhere– these are all terms used to describe Jane Eyre, a book written by Charlotte Bronte, who wrote under the pseudonym Courier Bell in the mid 1800s. Jane Eyre is a growing up story about Jane, an orphan who was abandoned by her evil aunt and cousins (sounding familiar yet?) to attend a boarding school for orphaned kids. After residing there for 8 years, she goes off to a mansion to tutor a girl, all while falling in love with the girl’s foster parent. (Don’t worry, I didn’t spoil anything for you because that’s the first half of the book and movie). 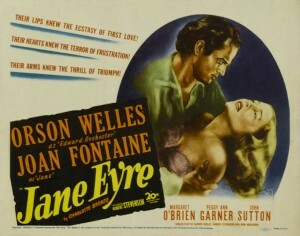 The 1943 film version of the classic stars Orson Welles as Edward Rochester, Joan Fontaine as Jane Eyre, Henry Daniell as Mr. Brocklehurst and Agnes Moorehead as Mrs. Reed. Of all the film versions out there, I chose this variation because Orson Welles is in it. Overall, the film stayed close to the plot of the book and was rather entertaining to watch. Of the parts of the book the film did keep, they were all mostly accurate and were able to tell the story in a new and reinvented way. I was a bit let down by the fact that the film completely skipped the gypsy woman scene in the book, because I found that to be very entertaining. On a side note, the film does come off dark–both the plot and the lack of lights used. There really wasn’t any joking around between Jane and Mr. Rochester (in the book, Mr. Rochester accuses Jane of being alien), and I didn’t notice any true connection between them until the film was almost over. The Lowood school scenes were especially the darker part of the film. The scene completely bypassed the typhus fever epidemic spreading through the school and only focused on Helen Burns (who I found out was a not-credited Elizabeth Taylor) alone dying instead of the whole school dying. They skipped the part where Mr. Brocklehurst becomes a figurehead while his true power goes to caring teachers. I personally think this film did its best to get Jane Eyre told in a constricted time limit. Although they skipped a few parts (like the grand dinner scenes and the entire St. John house hold), the film didn’t change the story of Jane growing up and becoming a woman. My favorite part would have to be the amazing overacting of Welles after Jane accepts his proposal. A minute prior, he was mumbling his usual serious talk (which I swear Marlon Brando had to adopt), and then he’s off in the car and hugging Jane acting as jolly as Santa Claus. The only change with the adaptation that bothered me was the lack of Jane’s dreams. She dreams that Thornfield will end in ruins and that Rochester walks away from Jane, who is holding a baby. The two were used in the book to foreshadow what was to come and thus made the book more interesting since it left the reader in a suspenseful state. The film even left out the opening scene of the book where Jane Eyre reads Gulliver’s Travels and her evil cousin John throws the book at her. Mr. Rochester’s history is left out as well as Mr. Rivers sort of taking the place of Mr. Lloyd. The film is a pretty good watch. Not if you forgot to read the book and you need to watch the movie for your test tomorrow, but it’s still a good film that is entertaining, taking into consideration that this moves fast for a 1940s movie.